This Necklace features a wonderful heart-shaped Brazilian Garnet: a semi-precious stone known for its more unusual purpley-red colour. It has a minimal setting in Yellow Gold with a matching chain and makes a simple and beautiful romantic gift. 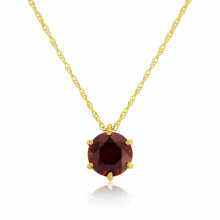 Perfect too for Valentine's Day and for all those January birthday girls who have Garnet as their birthstone.